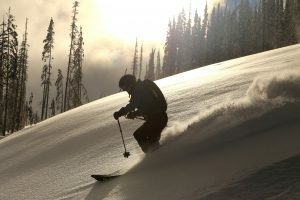 Remember way, way back when my buddy and I won a catskiing day in Rossland? We went to Red Mountain and had a fantastic time, but fluctuations in the freezing level skunked the catskiing part of the trip. The next year, there was no snow. Fortunately Big Red Cats are awesome, and they gave us a raincheck to 2015/16. Some things, it turns out, are well worth waiting for. B and I were the only people in the group with avvy training and gear, so we helped out with the morning drills for the rest of the group. 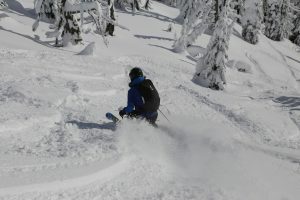 Then we headed out into the Monashees for a day of skiing some of the lightest, coldest snow I’ve ever encountered. We were booked on an intermediate/advanced cat, and it was strange for me – so used to lagging behind my far more experienced and technically capable ski buddies – to find myself the strongest, fastest skier in the group. 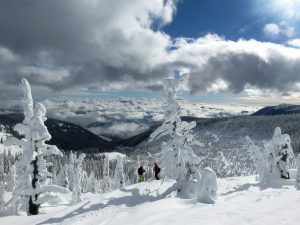 Our final run of the day was a grand finale on Mount Neptune, and with legs that still felt like they had miles in them after being shuttled around by the cat I was happy to charge right behind the guide through perfect Kootenay coldsmoke in the trees. An amazing day out, and getting so many powder runs in a single day really gave my untracked skiing a big boost that would hold through the rest of the season. If you’re ever in Rossland, I highly recommend giving Big Red Cats a go. 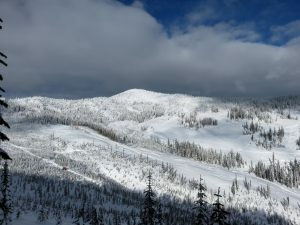 This entry was posted in Kootenays, Skiing on February 4, 2016 by Kay.